According to the news by Engadget, Sharp Corporation of Japan is launching its Galapagos series of media tablets on December 10th in Japan. The December 10th launch is scheduled only for Japan and the tablet will not be one of those cheap tablets targeting competitive markets. 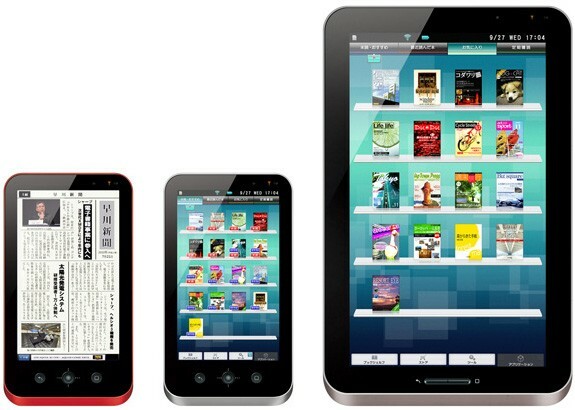 The Galapagos series of tablets will include a Mobile and a Home Galapagos model. The Mobile tablet will sport a 5.5 inch display with 1024 x 600 resolution and the Home model will have 10.8 inch screen with the resolution of 1366 x 800. Both of the tablets will have the usual features of a tablet including 802.11 b/g Wi-Fi as well as a trackball for navigation. Both the tablets are mainly crafted for the Japanese market, so we are not hoping of a release for the internation markets anytime soon. But Sharp is also aiming for an e-book store launch for the tablets that wiil include 30,000 newpapers, magazines and books. Sharp corporation has priced the tablets at ¥39,800 ($474) and ¥54,800 ($653) for the Japanese market, making the Galapagos tablets not competing for the cheap segment.